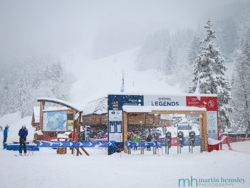 Couldn't resist posting yet another landscape photo on the mh2ski blog. 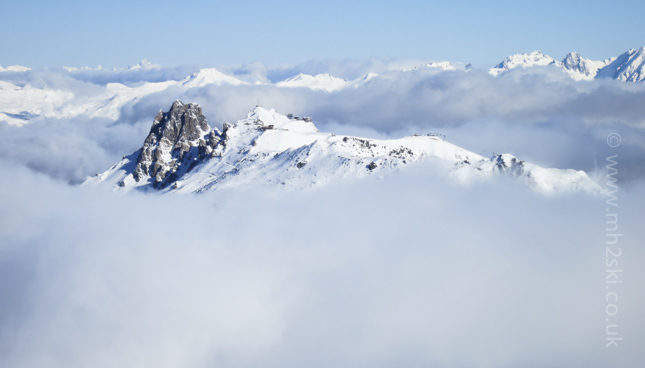 This was taken yesterday morning from the top of Mont Vallon looking across a sea of cloud with the Saulire peak poking through. Anyway, enough of me salivating about how stunning the mountains are here in Meribel; Michael and I are Ski Instructors after all and not working for the tourist office trying to advertise how awesome it is here. Let's have a chat about ski technique. One of my favourite topics when delivering private lessons is balance. There are four main advantages in having good balance; let me explain. Energy Efficiency - If we stand centered over the middle of the skis, it is the most energy efficient way of skiing, with our thigh muscles feeling reasonably relaxed. When I meet somebody new at the start of a lesson, it's not unusual for me to hear the words "My legs get knackered even before the end of the day." This is normally a sign that they are leaning back, and it doesn't have to be much either to feel the burn due to lactic acid build up in the muscles. So how can we stand centered, or as some people misleadingly call, it leaning forward? Flexing the ankle joint. 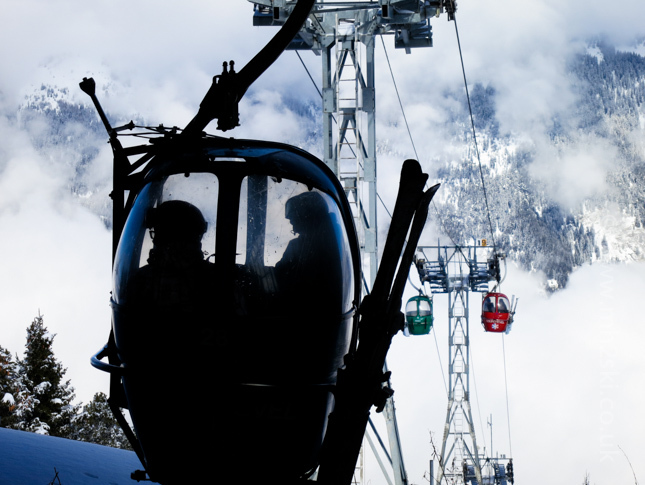 Yes, I know this sounds odd because we feel as though we are clamped into our ski boots. However, we can still flex our ankles forward into this incredibly energy efficient position. Absorption - If we are centered over the middle of our ski or as I call it, standing on the sweet spot of our skis, we will be in a position to absorb any terrain changes or bumps. Our legs can automatically absorb small bumps and any ridges especially if we are relaxed. If a skier is slightly leaning back and they see a bump coming their way, they automatically stiffen their legs then clatter over it and often lose their balance or even fall over. Sounds familiar? Have you ever followed behind a good skier and admired how their legs appear to work like shock absorbers? This can only happen if the skier is centered over their skis. Weight Distribution - If we are centered over the middle of our skis, our body weight/mass will be distributed along the full length of the skis. Now this is great news because this means that all of the lovely sharp metal edge is gripping into the snow creating friction, right from the tip of the ski all the way through to the tail. If a skier is slightly leaning back they have immediately reduced the amount of the ski's edge that can grip into the snow. By leaning back, or dropping the hips as Michael calls it, a skier will only have about a third of the length of the ski's edge working against the snow. What we try to do is use every meal we have consumed on a ski holiday (including cooked breakfasts, pizzas and tartiflettes) by sending them down to the full length of the skis, and stand centered. Steering - When we are centered over the skis, it is so much easier to steer (turn) the skis. This is because the pivot point is directly underneath the foot, and helps makes the ski boots and skis feel like an extension of our body. If a skier is leaning back, ie out of balance, their pivot point will be at the back of the skis behind the feet, making it much harder to turn. Often you will see skiers on the piste hoiking their skis around a turn: this is an outcome of leaning back. Earlier this week I was skiing with Claire, Lucy and Daniel. We were fine tuning and tweaking our balance to help with energy efficiency, absorption, weight distribution and steering. We also found some fabulous pistes to ski on. The snow conditions are utterly amazing at the moment due to regular snow storms. 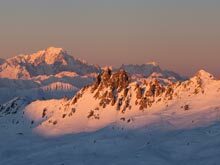 One morning we skied over to the Courchevel Valley up and around La Tania and Le Praz. 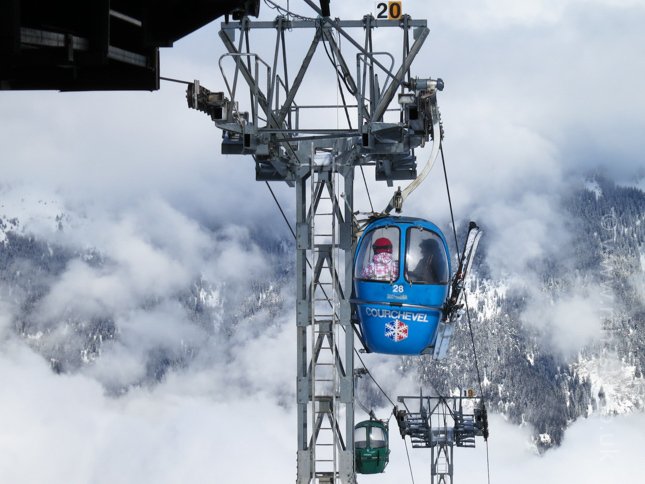 The lift company has investing heavily over there with new snow cannons and a brand new chairlift above La Tania called Bouc Blanc. 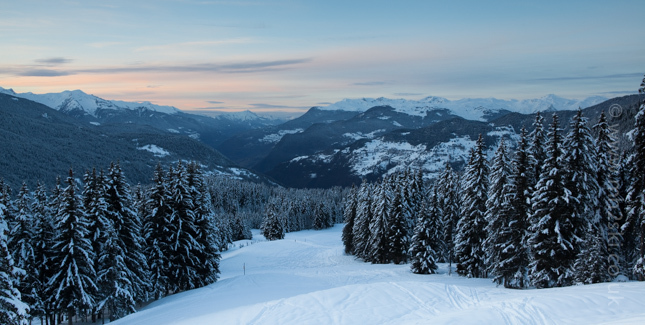 The foundations for a new chairlift coming out from Le Praz, where the Olympic ski jumps are located, have been laid, which will result in one of the oldest bubbles being replaced. Speaking of the Winter Olympics, what a great spectacle it is so far. On the first morning I was trying to delay going down to the ski school as late as I dared because I wanted to follow the mens downhill race on the internet. 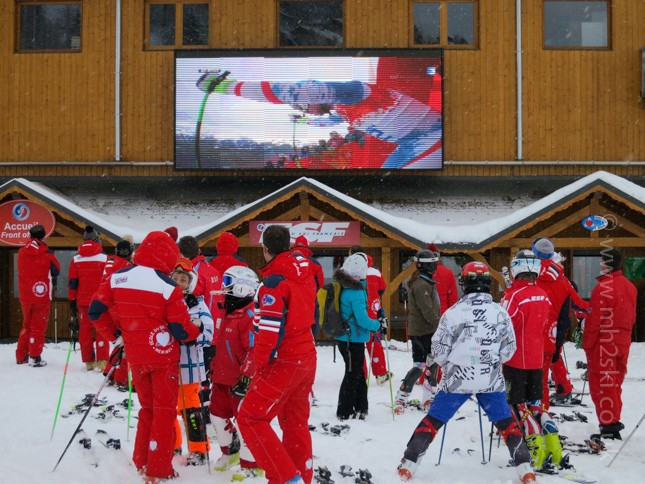 I didn't have to worry however, the large TV screen above the ESF had conveniently been switched over to show the racing. As I mentioned a moment ago, the snow conditions are absolutely fantastic now. Just like in the UK, we have been on the receiving end of many weather fronts which have resulted in high winds and plentiful snow falls. 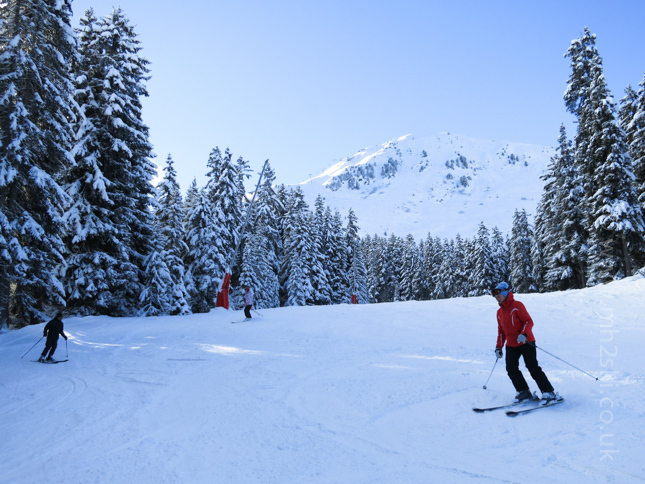 If you are coming out over the holiday period you will enjoy some great skiing conditions. Oh, and the views are pretty stunning as well. I shot up to one of my favourite viewpoints to shoot this sunset at the beginning of this week. Don't forget you can click on each photo for an enlarged version. If you enjoyed this article on ski technique, you might be interested in reading another called "Dig it in Camilla" that Michael wrote during last winter. 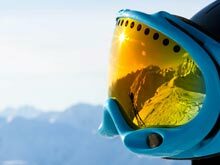 It is a short blog post about some of the myths about ski technique that you may have come across. Feel free to share away on Facebook, Twitter and Goggle+ by using the social media icons. Or you can leave a comment below, it's easy to do. Have a great week everybody, and hope to see you on the mountain this winter. Martin.